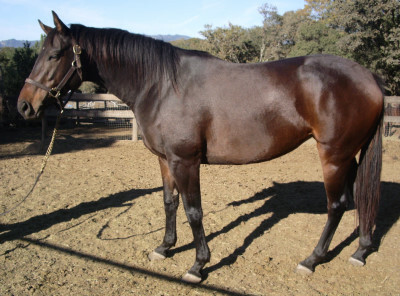 “Luvy” is a lightly raced 2002 dark bay or brown filly. She’s sound because she wasn’t a race horse long enough or run fast enough to injure herself. Smart filly. She’s got a sweet disposition and is currently courting The Barking Shark, along with the other of Shark’s favorites, Dawaytostorm.